Celadon Ceramic Sculptures (Pair), "Lucky Cats at Play"
Working in cool blue-green Celadon ceramic, Duangkamol depicts the lucky Maneki Neko. 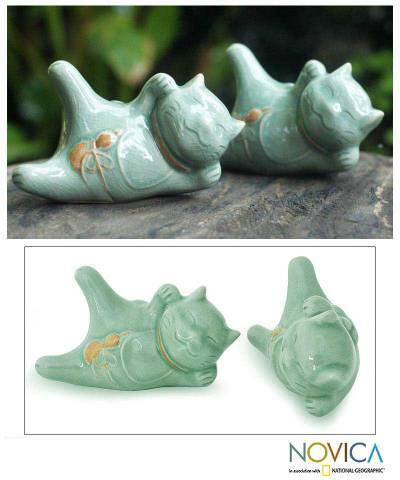 These figurines depict Japanese bobtail cats who bring good fortune. Cats are a favorite animal of Duangkamol. You can find celadon ceramic statuettes 'Lucky Cats at Play' (pair) by Duangkamol in sculpture categories such as Animal Themed Sculpture, Celadon Sculpture, Good Fortune Sculpture and Ceramic Sculpture. Enjoy exploring these sections for other Novica treasures.